Foster Wallace, D. (2004). The Broom of the System. Penguin Books. Penguin Books, 2004. 467 pages. Lenore Sr. is missing. The phone lines at Frequent and Vigorous are mixed up. Rick has a dream about Queen Victoria. 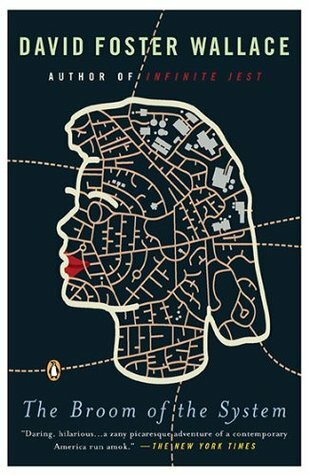 the shape of East Corinth (as Jayne Mansfield) is revealed. Andy leaves Mindy; Rick tells Lenore a story about a man who falls in love with a woman a toad in her neck (she dies); John LaVache is revealed to think of himself as a game show contestant; Lenore and Rick arrive at Amherst; Rick tells the story of his first and only attempt at approaching a woman (Janet) at a hors d'oeuvre bar, which ended with a Ritz cracker and bologna landing on Janet's nose; Lenore watches LaVache support his leg; Rick meets Andy Lang at The Flange, which is now a gay bar, and discovers Andy's coincidental experience on Corfu; LaVache shows Lenore the drawing of a man climbing a slope. On the jet, Rick tells Andy the tragic tale of Lenore's family while she sleeps; Lenore et co meet Reverend Hart Lee Sykes. Candy tells Lenore that Andy is into her; Neil Obstat and Andy discuss Lenore; Rick gives Lenore a promotion; Dr Jay gets instructions from Lenore Sr., via a proxy.